As my fingers are getting glued up with all the gluing I am doing at the moment for my journaling index cards and postcards, I thought it was about time to join up with Aimee at Artsyville for Glue it Tuesday. This is a journal page i did this morning as I want to have a change from my normal faces. It is a sort of tweetie bird/owl! The other bit of gluing I did today was getting the packages ready to send off for my weekend giveaways. I know they are postcards but I thought it would be nice if the winners could have a little pocket for them. The winners from last weekend were for PPF - Giggles of the Happy Tiler Blog and for SS – Stephanie Stark. I will leave my email address on their last post and if they could go to the Postcards tab and choose two postcards and email me with their choice and their snail mail address I get them into the post. 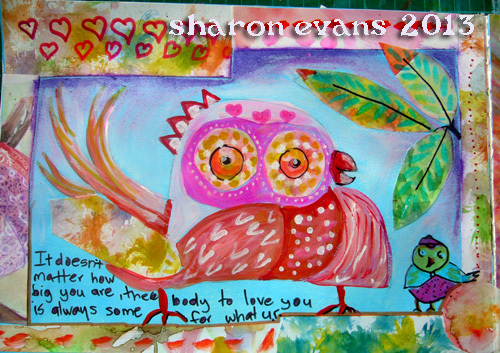 I love your tweetie owl, and I think it's so much fun to roll and peel the dried gel medium off my fingers! Love your quirky tweetie bird owl for Aimees glue it Tuesday!! Great quote!! 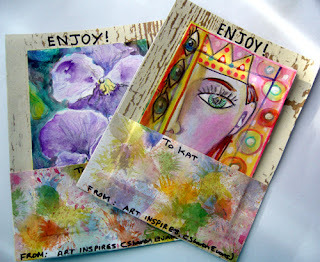 Big huge thank you for my winning your beautiful postcards!! I feel so blessed thank you so much!! I love that owl! Great painting! Nothing nicer than Glue under the fingernails :) I love the little envelopes you have made for your cards Sharon, Have fun with your sparkle podge! Dear glued fingers! How fun to see your art works! And how nice for those who get to choose postcards in pockets! Too fun! Love the message - so very true and such a lovely card! adorable birdie piece and I love those pockets you made for your giveaways-a really nice touch!